Michael Siteman has a new gig at Internap that he announced on his LinkedIn page. When I checked in with Michael he had over 50 congratulations on LinkedIn. Below is a short description of Internap (INAP) if you aren't familiar with the history. Founded in 1996 on the principal that there had to be a better way to send information over the Internet, INAP has become a leading technology provider of Internet infrastructure through both Colocation Business and Enterprise Services (including network connectivity, IP, bandwidth, and Managed Hosting), and Cloud Services (including enterprise-grade AgileCLOUD 2.0, Bare-Metal Servers, and SMB iWeb platforms). I have known Michael for so long and we regularly chat about so many things that I felt like I needed some help on writing a post. So reaching out to two friends who are active members of 7x24 Exchange President David Schirmacher and Executive Director of Carolina's chapter Robin Aron they came up with some greats works to describe Michael. Strategic, Collaborative, Effective, and Integrity. These four words resonate with my experience and I couldn't come up with better words to describe working with Michael on data center projects. Michael has had a history of gigs at Staubach, JLL, Digital, 7x24 Exchange, and his latest gig is at Internap. One of the cool hobbies Michael has is collecting guitars. Above are a few of Michael's favorites. Next time you see Michael you can ask about the history of these beauties. Jim Smith updated his LinkedIn Profile with this. There is no other news that I can find on Jim Smith's change. Throwing this up on my blog will let other media friends ping Microsoft to get more information. Connecting with your kids is a challenge. My daughter is 14 and my son is 12. This morning driving the kids to their bus stops my daughter was frustrated Taylor Swift's song "New Romance" is not part of the Apple Music subscription. Sticking to Taylor Swift as a subject, we commented on how smart Taylor Swift is using humor in its Apple ad. What my kids also understand is how smart Taylor Swift was in her famous letter to Apple pointing out the three month free trial would be a financial burden on many artists.  I’m sure you are aware that Apple Music will be offering a free 3 month trial to anyone who signs up for the service. I’m not sure you know that Apple Music will not be paying writers, producers, or artists for those three months. I find it to be shocking, disappointing, and completely unlike this historically progressive and generous company. Apple then made a smart move and made a change, and talked to Taylor Swift. Taylor Swift is now a part of Apple Music and as my kids see Taylor Swift as one of the leaders in Apple's advertising. Which then brought up an interesting point. Taylor Swift did a good thing. She was willing to stand up for something and possibly make an enemy. Which then reminded me of how many times I've written a blog post to stand up for something and speak my mind. And, some of my best friends are now people at these companies who choose to reach out and have a dialog. After many more discussions we are working together on changing the way things are. Just like Taylor Swift. I won't point out those specific companies as that would probably get their PR groups stirred up and I want to keep my friends at those companies. The story of doing the right thing resonated with my kids. Which was a nice ending. Then my daughter said why don't I focus on this blog more and make money that way. I then told them how hard it is to make money running a blog. But they were still interested in how it works. I told them let's talk more and we can go back and add advertising on the site and they can keep the money from the blog if they help work on it. They are both in for giving it a try. If I could have a conversation like this once a week it would be great. Driving the kids to the bus is something I do whenever possible. The data center industry is a relatively small community. Even though the overall data center market is growing there is a consolidation of power going on. There are shifts to those who are the best at building out data center infrastructure. Some stick to a group of people they have worked with for years like being loyal to your alma matter or home team. They take comfort in the familiar. This is where the term "old boys club" can be used to describe this behavior. The Golden State Warriors won the NBA finals and Steve Kerr was the star along with MVP Stephen Curry. Steve Kerr was seen on his plane flight back to Oakland with two things that don't fit a SF bay area focus. 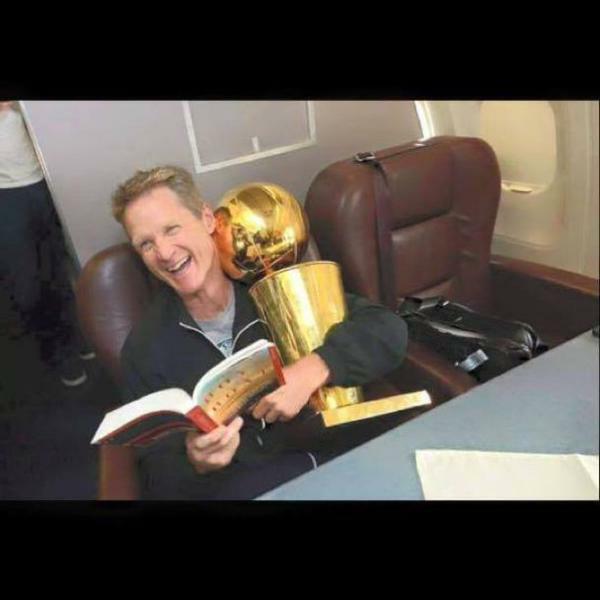 If Steve Kerr was old school he would have a SF 49ers shirt or SF Giants and a book about UC Berkeley's crew team. Digging a bit further it appears that Steve Kerr and Pete Carrol have become friends, coaches who want to have the best team. Looking carefully, though, you can see commonalities — California sensibilities, positive energy, open-mindedness and a constant search to find new ways to motivate varied player personalities. ”I always loved Pete Carroll,” Kerr said recently. “Hated USC (Carroll’s former coaching stop) but loved Pete Carroll. And loved the way his teams played. The ideas continue on how they shared ideas on how to be the best. “We talked a lot about just kind of the atmosphere around a team and how you’re going to approach the daily routine,” Kerr said. ”To me, the X’s and O’s ... they’re an important part of coaching but a relatively small part. Eighty percent of it is just relationships and atmosphere, what your daily routine and culture is. Practical result: Kerr saw how Carroll’s players reacted when the Seahawks played music throughout practice, so he installed speakers at the Warriors site, and there is now music playing through most Warriors sessions. ”It’s a staple for the Seahawks — it’s really uplifting and it’s fun,” said Kerr, who has piped in an array of rap and rock. Long, long time ago I thought of working for UPS. Why? Because my degree choice of Industrial Engineering made me think of where I would work. Luckily I realized that going to work for high technology companies and applying industrial engineering was a more interesting path which led me to HP, Apple, and Microsoft. One of my first passions was logistics and I worked on logistics systems and software from 1983 to 1987 at HP and Apple. I still like reading about FedEx, UPS and other logistics challenges. The WSJ has a post on UPS's Orion software a 10 year effort to squeeze even more optimization out of routes. What I found most interesting beyond the $100s of millions of dollars saved a year is listed in the following. The WSJ says the Orion needed to learn to accommodate people. This one made me laugh because it makes you think the software has its own mind of what it decides to do. No. It was the executives and software developers who choose to ignore the human usability issues. In the next paragraph, the other lesson of executing the plan is described. “The project was nearly killed in 2007, because it kept spitting out answers that we couldn’t implement,” Mr. Levis recalls. The earliest versions of Orion focused on getting the best mathematical results, with insufficient regard for the interests of the driver or the customer, who value some level of routine. For example, regular business customers who receive packages on a daily basis don’t want UPS to show up at 10 a.m. one day, and 5 p.m. the next. And a customer who is expecting a shipment of frozen food needs delivery as soon as possible, even if efficiency demands that someone gets priority. How could UPS have avoided some of these mistakes? The approach I use is to not treat the users as individuals in the system. It can be too easy to discount things because you don't see the impact of points they make. Think of the team of people working together. How do they work together and how well your software support them working better as a team. Even now I would say Orion could be improved if was a way for a team of drivers to work together make feedback and suggestions on improvements of usability.